It's not easy breathing in a paper bag...especially if you're only a head. The film opens with Dr Martin (Robert Powell) arriving at a secluded asylum "for the incurably insane" located in an unidentified area of rural Britain. He makes his way to the office of the institution's manager, the wheelchair-bound and authoritarian Dr Lionel Rutherford (Patrick Magee). Rutherford explains that he owes his current incapacitation to an attack by an inmate ("Never turn your back on a patient", he grimly advises), before turning his attention to Martin's recent application for the post of head doctor at the establishment. He proceeds to propose an unorthodox plan to determine Martin's suitability for the post. One of the asylum's current inmates is Dr B. Starr, the former head doctor who underwent a complete mental breakdown that left Starr apparently completely unaware of any genuine previous identity (and thus possibly suffering from false memory syndrome). Rutherford challenges Martin to interview the inmates of the asylum, and to deduce which one is Dr Starr. If his choice is correct, then Rutherford will "consider" him for the post. 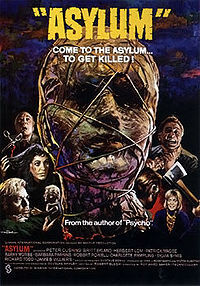 Martin proceeds to the upper floor of the asylum, where the inmates are held in solitary confinement, and is greeted by the kindly attendant Max Reynolds (Geoffrey Bayldon), who admits him through the security door to the inmates' cells. The framework for the tales to be told now established, Martin proceeds to the first cell, and the first of the four stories within the main plot begins. In the cell, Martin meets Bonnie (Barbara Parkins), who recounts a tale of how she was having an affair with the married Walter (Richard Todd), whose wife Ruth (Sylvia Sims) has recently started studying alternative religions, particularly voodoo. She is also refusing to grant Walter a divorce. Walter and Bonnie therefore conspire to kill Ruth. This is achieved by Walter buying her a new chest freezer, installed in their house's cellar. He shows this to Ruth, and then immediately kills her with an axe, before proceeding to dismember her, wrapping the pieces in brown paper, and placing them in the freezer for later disposal. Spotting a voodoo charm bracelet that she was wearing, he contemptuously throws this into the freezer as well, before returning upstairs to await Bonnie's arrival. The scene shifts back to Bonnie's cell. She calmly informs Martin that, when the police arrived, the body parts had gone, and that her tale was disbelieved, leading to her incarceration. However, she insists, her story is true - and she turns fully towards Martin, showing her hideously axe-mutilated face to him. Inside this cell, Martin meets Bruno (Barry Morse), who is sitting cross-legged and sewing imaginary clothing. Max leaves Martin with Bruno, and the latter, insisting on his own sanity, recounts the story of how he came to be an inmate. He states that he was previously a tailor in London, but that business had dropped steeply off, to the point where he and his wife Anna (Anne Firbank) were threatened with eviction by their landlord due to their inability to meet their rent payments. This situation seems set to improve when a Mr Smith (Peter Cushing) enters the shop one day, commissioning Bruno to make an extremely expensive suit from a special fabric which he provides. However, Smith sternly insists that Bruno must work on this suit between 12p and 5a, stating "there must be no mistake." However, Bruno, while working on the suit. He pricks his finger with his needle, and the blood that drops onto the fabric promptly vanishes without trace. Bruno observes this with understandable concern, and resolves to work more carefully in the completion of the suit. The suit is duly completed, and Bruno takes it to Smith, requesting his payment. However, Smith proves to be dangerously obsessive. His son had died some time before, and - although he had once been rich - he is now all but penniless, having spent his fortune on a book of knowledge which detailed how the dead could be returned to life if clothed in garments made from the fabric that he had obtained. Bruno is understandably distraught, and refuses to hand over the suit. Smith draws a revolver and attempts to intimidate him into doing so. A struggle ensues, during which Bruno accidentally shoots Smith dead. In the next cell, Martin is greeted by a surprisingly cheerful and affable young woman, Barbara (Charlotte Rampling). She freely admits that she is no stranger to asylums, having been in one before, and tells us the story of what happened when she was last released from one. It begins with Barbara's brother George (James Villiers) and her nurse, Miss Higgins (Megs Jenkins) welcoming her back to their expensive-looking home. While they both have her best interests at heart, they are concerned for her welfare in a near-draconian way, especially in their attempts to wean her off of her medication. They are also concerned for her when she begins confidently asserting that her friend Lucy (Britt Ekland) will soon be coming to visit. In the cell, Martin meets Dr Byron (Herbert Lom), who is aware of Rutherford and appears to regard him with fury and contempt. He informs Martin that he is working towards soul transference. He is planning to do this with the aid of a small automaton whose head is made in likeness of his own, and shows Martin a cupboard full of earlier models. He is planning to effectively "will" his own mannequin to life, and tells Martin that the interior of the robot is organic, a miniaturised version of his own viscera. His aim is apparently to prove his sanity via this momentous breakthrough. Martin concludes his interview, and Max shows him downstairs to deliver his judgement to Rutherford. Meanwhile, Byron stares intently at his mannequin. Suddenly, the mannequin stirs into life. A triumphant Byron places it on the floor of his room, and it proceeds stealthily out of the door and into a dumb waiter, heading to the ground floor. Downstairs, Martin chooses - rather than deducing Dr Starr's identity - to confront and lambast Rutherford for his harshly pragmatic regime. He argues that the isolation of the inmates, plus the lack of any attempt to cure or re-habilitate them, amounts to barbarism. Rutherford coldly argues in return that the inmates of this asylum are completely incurable, and impossible to release. Holding up a lobotmising tool, he states bluntly, "This is the only way to deal with Byron's sickness..."
Martin has heard, and seen, enough. Almost as an aside, he announces his decision that Byron (presumably due to his scientific success) was Dr Starr, before purposefully heading towards Max's office to telephone the police, ignoring Max's sudden cry of "No, don't go in there!" Inside the office, Martin discovers the corpse of a recently-murdered intern. He turns in shock to Max, who almost apologetically informs him, "I'm afraid your guess was wrong... I am Dr Starr." The two struggle, but Starr gains the upper hand, and uses a stethoscope's tubing to strangle Martin. Having carefully also used it to assure himself that Martin is dead, Starr begins quietly giggling - a giggle which quickly builds to maniacally triumphant laughter... The scene changes to some time afterwards. A new applicant for the post of head doctor arrives at the asylum, to be greeted by "Max". Closing the door firmly behind them both, the latter affably states, "Got to keep out the drafts - as Dr Starr used to say ..."